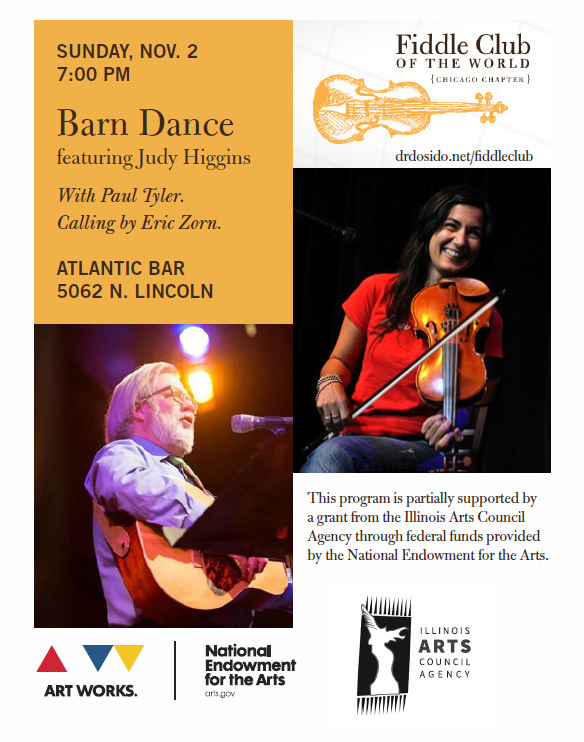 This event is the culmination of the apprenticeship grant that Judy Higgins and I received from the Illinois Arts Council. We’ve met every week for the last half year to learn about 18 to 20 tunes. We’ve worked on building up speed and drive with the bow. Judy’s playing has become way more danceable. And we’re going to test that out tonight with a return to the Atlantic Bar & Grill for a old-time square dance in the back room. The band, Judy and the Big Dogs, includes Steve Rosen, Chris Walz and yours truly. Eric Zorn will call – and teach – the figures. Come on out at 7pm, fill the floor and square your sets. We’re gonna have a big time tonight.